In July of 2018, the Community Skill Building group of Mankato welcomed James Londgren. James recently graduated from high school and was eager to gain work skills. James is willing to help others and works diligently at volunteer opportunities. Struggles arose for James when following specific directions, maintaining focus on the task at hand, and interpersonal communication. I, Lindsey Schmitt-Lifeworks Facilitator, spoke to James and his team to get to know him better and discovered what works best for him. Through coaching and communication, James continues to gain confidence and control of his speed and processing. 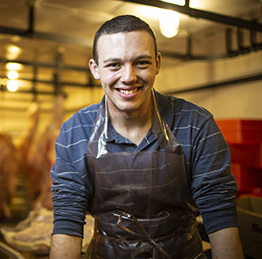 James applied, interviewed, and received a job offer at Hilltop Meat Market. He cleans there daily from 2-4pm. 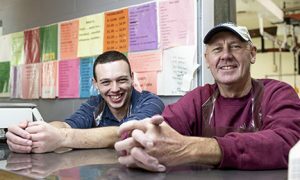 The owner, Dennis Wick, said, “(James) does well cleaning one thing at a time.” He receives Lifeworks follow-along support to contiue to build and maintain job his skills. James still joins Community Skill Building on Fridays where he volunteers at Echo Food Shelf and learns in class. 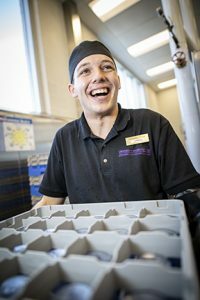 Sarah Diel-ECHO Food Shelf Assistant Manager said, “James is happy, enthusiastic, and willing to work.” When in the classroom environment James actively participates in class. He occasionally needs reminders that others can participate as well. Through peer to peer education, James has demonstrated his work ethic and experience in achieving independent employment.